As Thanksgiving approaches, and many of us will cook (and argue) with fellow family members, it’s a pleasure to spend time with families on TV who act not that differently from our own. Anyone who’s lived through 2017 can confirm that, in these troubled times, comfort television is one of the few universal coping mechanisms we have left. The Great British Bake Off is one of the few shows that feels good to me when nothing else does. Here is a universe where the strongest words a judge can say are “That’s a shame,” and where minorities and women—and especially women over the age of 40—dominate. When it feels like there’s so much anger everywhere, watching people struggle to make fondant in a tent is reliably soothing. Unfortunately, the production schedule of the Great British Bake Off (titled the Great British Baking Show Stateside) has, like so many other of our institutions, not kept up. The newest season, since the show’s controversial move to Channel 4, is currently airing in the UK, with no plans yet by PBS to bring it stateside. Over at the BBC, they hope to capture the GBBO audience with a new show: The Big Family Cooking Showdown. The series here in the United States. The show is ostensibly a search for Britain’s best home cooks. Family teams of three compete against one another over the course of an episode for a in the next round. The shows are divided into three challenges: one where the families cook dinner for four people for £10, one where they are tasked with hosting the judges for a two-course dinner at their home; and one where there are given the remit to “impress the neighbors,” a hopelessly British conceit, with a boffo meal. 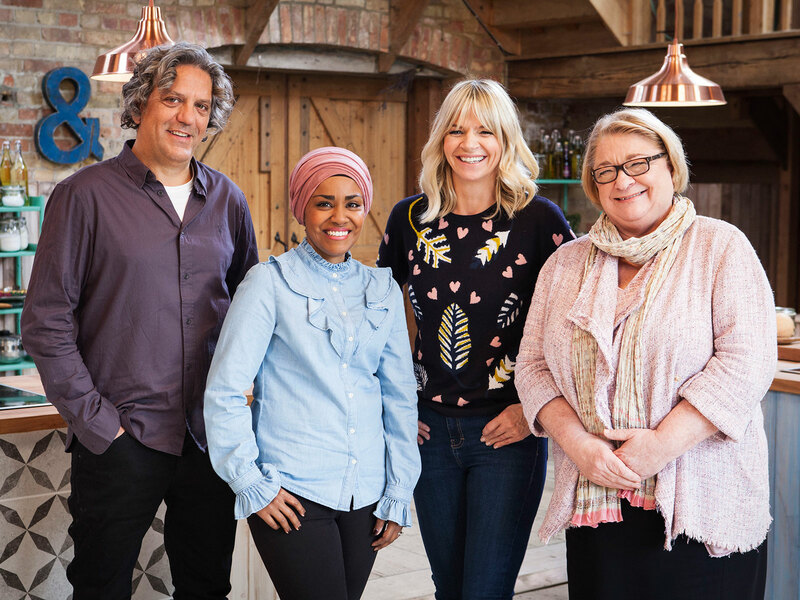 There’s a team of two hosts, Zoe Ball and Nadiya Hussain, and two judges, Rosemary Shrager and Giorgio Locatelli. Ball is an affable presence, a longtime television host who keeps the show moving. Hussain, who GBBO fans may remember as the winner of a previous season of Bake Off, is a sweet addition. Ball and Hussain visit the homes of contestants as they prepare dinner for the judges, and Hussain’s facial expressions when she sees what is being prepared flashes between perplexed and delighted in a matter of a second. Does she think a disaster is looming? Probably! But she comes off as a combination of concerned and supportive, like if Tim Gunn visited your kitchen. The judges are less of a winning combination together. In the U.K., Shrager is an Ina Garten-type, a cooking teacher and frequent reality tv host and judge. She fills the same role here, interjecting evaluations with advice—"It’s overcooked. With fish like this, you only need to do it on one side..." Locatelli, a Michelin-starred chef in the U.K., fills the role of effusive Italian to a tee, gesticulating when he gives interviews to the camera and speaking with the cadence of a sportscaster in a football halftime show (“I can see why your neighbors would come around!”). When he describes ways that the contestants can go wrong with their strategies, however, his eyes go to a dark place: that of an Italian man living in Britain who has been served many, many bad meals. Even a cursory viewing makes it apparent that show’s producers hope to have it compared with the network’s dearly departed forebear, from the tripartite challenges to the hosts and shooting location (a barn rather than a tent). Like GBBO, the joy of the show comes from the contestants themselves. Here, because the families are in groups of three, they don’t interact with their competition from week to week. Instead, they interact with each other. Their back-and-forth on the show is delightful. Like all families, everyone has their own opinion on how to do things. Watching those interactions are the best. There are teenage daughters hopelessly embarrassed by the mere existence of their parents; brothers who cook cheffy, bro-y dishes in their tiny flats; South Asian and West Indian trios in full command of an arsenal of spices; and dyed-in-the-wool English types who proudly underspend on the £10 challenge. At one time or another, they all argue. It’s great. A few Christmases ago, I brandished a kitchen knife at family members to protect the sanctity of a prime rib I was cooking—if you want it well done, you are welcome to have prime rib somewhere else—so the low-stakes tensions of family cooking feel cozy and familiar to me. On the show, a sister preparing salmon may say “I don’t think it’s hot enough,” and other will immediately snap “It is hot, Chantal.” Many, many home cooks have had that particular experience with an aunt or a cousin or an in-law. Moreover, some of completed dishes are clearly bad. Disasters happen, even during dinner parties. That’s why my grandmother advised my mother to “serve two martinis before dinner to everyone, then they won’t care what you’ve cooked.” The disasters are enjoyable simply because they’ve happened to all of us, too. I still miss Mary Berry and Mel and Sue. Paul Hollywood fans can catch him on the new Bake Off, where his tanning regimen makes him look decidedly overbaked. As Thanksgiving approaches, though, and many of us will cook (and argue) with fellow family members, it’s a pleasure to spend time with families on TV who act not that differently from our own. The Big Family Cooking Showdown debuts this weekend on .